Patent licensing has become big business in recent decades. The high technology sector, in particular, places a high value on patents and licenses. Semiconductor companies have traditionally led the charge, given the myriad of competitors and patents in the industry, and the groundbreaking licensing campaigns driven by Texas Instruments in the 1980s. Today, intellectual property groups are firmly entrenched in every major corporation - from large communications providers such as Ericsson to consumer product giants like Apple. Each is responsible for growing and/or defending its intellectual property assets, with stakes often in the hundreds of millions of dollars. Fundamental to building and executing any successful patent licensing program is the ability to find and prove evidence of infringement, often through reverse engineering methods. This article explores the role of reverse engineering in identifying patent infringement, and offers some observations about the future direction of patent licensing and infringement analysis. Reverse engineering (RE) helps determine whether or not the patented inventions are being used in the industry by a particular company. 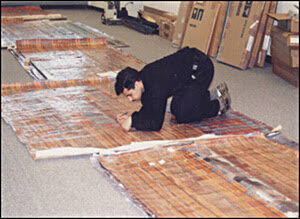 A product is purchased and disassembled in order to understand how it was built, how it works and what it is made of. The RE process usually involves multiple types of analysis. Which type of RE to apply is determined by the type of technology and the industry the patented invention is being used in. System analysis, which identifies how devices are used together — may include analysis of signals and software inside or between chips using sniffers, probing, data capture or literature. Systems RE is prominent in finding evidence of patent infringement in the communications/networking, computing, consumer electronics and wireless sectors. Patent infringement in these industries, which are largely standards driven, has historically been identified based on literature. With technology convergence, multiple suppliers and increased competition, finding patent infringement for standards-based products is evolving from standards-based documentation to more complex RE techniques (see chart above). Techniques for reverse engineering have had to keep pace with technological innovations. For example, the identification of organic materials used in low-k dielectrics, CIGS solar panels or optical waveguides is especially challenging, due to both minute quantities and the huge range of possible material combinations. Millions of transistors on a chip also means that RE tools have to clearly present increasing quantities of both hierarchy and interconnect. Gone are the years of tracing a circuit with markers and transparencies (see image at right). They have been replaced by custom RE computer-aided design (CAD) software like Chipworks ICWorks. In addition to modeling 10-plus layers of interconnect, this capability requires high-speed image acquisition and image database software. With this, we can give clients access to a virtual scanning electron microscope (SEM), with which they can view the device. Miniaturization also means thinner layers of material, so delayering and material analysis have fewer atoms to work. This drives sample preparation and analysis techniques to new levels. Energy beams are rapidly replacing the old mechanical polishing wheel as the tool of choice. Identifying patent infringement involves mapping relevant patent claims to the results of reverse engineering a competitive product, in order to generate evidence in the form of a claim chart. The following case study is presented for illustrative purposes. Reviewing product and standards documentation, performing physical inspection, board level circuit tracing, and functional testing. Armed with these results, the IP group director was able to validate an opportunity to monetize patents not previously considered part of the IP strategy - potentially worth hundreds of millions of dollars in licensing revenue — for just one negotiation. As described above, and regardless of industry, it is all about having enough claim charts to substantiate your licensing position and achieve a favorable outcome during a negotiation or litigation. Our experience suggests that intellectual property groups realize a high return on investment using outsourced reverse engineering and patent infringement analysis. On average, for every dollar clients spend on Chipworks services, they earn over $100 back in cross-licensing revenue and/or save over $100 in royalty payments. In an industry where the stakes are in the tens and hundreds of millions of dollars, investing in sound patent and technical analysis to get the facts is worth it. There are a few key trends influencing the direction of patent licensing and infringement analysis. One of them is technology convergence. We are seeing more and more of this in products such as smart phones and mobile computing devices, such as the iPad and Kindle. It is also being reinforced by newsworthy mergers and acquisitions, such as HP with Palm, as well as by the entry of lower cost competitors from China and other Asian countries. Technology convergence translates into more competition, as well as an increase in the number of players involved in the development and commercialization of a single product. All of this points to greater licensing complexities, not only with respect to determining if patent infringement exists, but who is ultimately responsible for it. 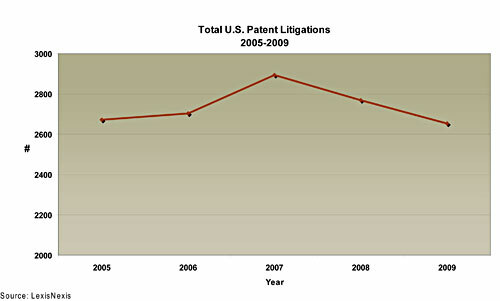 The other trend is the relatively steady state of patent litigations. Despite tough economic conditions last year, the overall number of high-tech patent litigations has remained relatively stable (see chart). This is largely being driven by the licensing activities of a growing number of nonpracticing entities (NPEs). NPEs are companies that assert patents without developing or selling any products of their own. Although companies who find themselves up against NPEs have few defensive strategies at their disposal, reverse engineering can help. It can be used to defend a position of non-patent infringement. It can also be used to find evidence of prior use of the invention, in order to weaken the validity of the opposing party's patent. The landscape of high tech patent licensing continues to evolve, growing in complexity as a result of technology advancements, convergence and greater competition. Finding evidence of patent infringement through reverse engineering is a key element in building and executing a successful licensing program. Chipworks provides reverse engineering and patent infringement analysis of semiconductors and electronic systems. Based in Canada, Chipworks maintains offices in the US, Japan, Korea, and Taiwan.